← With HuffPo purchase, AOL just might, finally, be turning the corner. But probably not. Of the 4 or so principal elements of SEM campaigns — keyword selection, bidding strategy, landing page optimization and ad copy development, it’s the latter that probably receives the least amount of rigorous attention and testing by advertisers. Yet ad copy optimization is a critical factor in the quality, cost, efficiency, and ultimately the profitability of your SEM campaigns. No marketer would argue that it’s generally a good thing to have clear, persuasive, creative, benefit-oriented ad copy that uniquely explains your business in a way customers can understand. So, uh, yeah — do more of that. But when it comes to Search Engine Marketing, there are more tangible & immediately-quantifiable advantages to improving and optimizing your ad copy. That’s because Google calculates a Quality Score that impacts the placement where your search ad is shown and how much you’ll end up paying for it. Q.S. is a factor of several measures, but the ad’s click through rate is one of the most important. So besides the fact that a higher CTR obviously gives you greater volume for a given number of impressions, the higher CTR can also lead to lower costs per click. 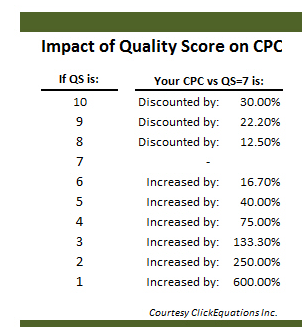 Ok, so your ad’s cost is a factor of quality score, and quality score is a factor of click through rate, and click through rate is a factor of ad copy effectiveness. So what’s an efficient way to generate better ad copy in order to lower your ad’s costs? For the last few months I’ve been a beta client (on behalf of Hunch’s SEM campaign) for an impressive early-stage startup called BoostCTR, working directly with its CEO, David Greenbaum. BoostCTR acts as an automated exchange between vetted, skilled ad copywriters and SEM marketers who want to optimize their ad copy. Think of it as self-service, micro-outsourcing to a broad pool of talented writers. BoostCTR’s model allows copywriters to review your existing ad groups and submit new ad recommendations that you then approve, reject, or edit. At that point, a controlled test begins to determine whether the submitted “challenger” ad can beat your defending champion. The advertiser pays only once a submitted ad becomes a proven winner (with statistical significance); pricing is currently a fixed cost of $60-$90 per winning ad, depending on how many ad groups you commit to running. Writers who submit winning ads are paid a fixed price for their efforts. SEM marketers who have never rigorously tested or optimized their ads are likely to see massive, immediate improvements; BoostCTR says that CTR improvements of 50% are typical. If you’re starting from a stronger position and you’ve done some testing and optimization (this was the case with Hunch’s ad groups), you may see more gradual improvements, and writers may not nail it on the first round. But since you only pay once there’s a winner, and writers keep submitting new ideas (and learning from what didn’t work) that you can approve, you’re still likely to get some significant benefits over time. I have. 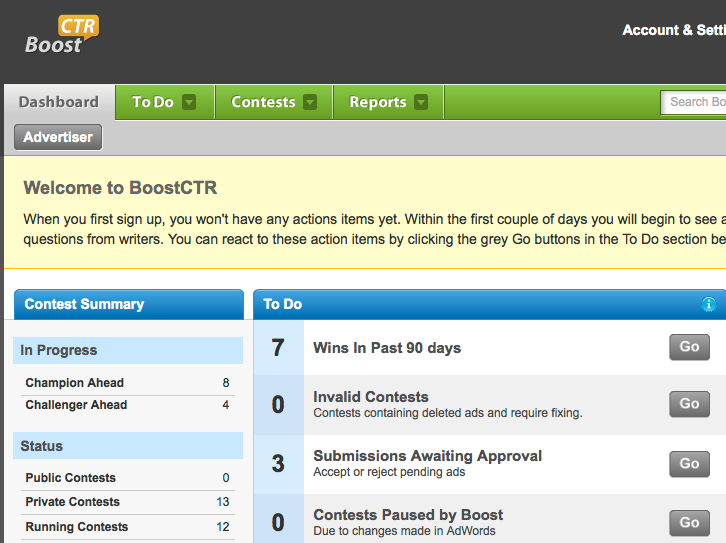 BoostCTR’s website is surprisingly intuitive and full-featured for a company in such an early stage. It recently raised a first round of funding (disclosure: Founder Collective participated, and I’m an investor in the fund), and Greenbaum says that near-term priorities include sprucing up the site, adding the capability to do simultaneous copy testing within one ad group, optimizing for deeper metrics like CPA, and the hiring of a senior writer to vet & coach the company’s free-lance pool of copywriters. BoostCTR’s approach provides an easy, scalable, efficient way to improve the efficiency of your SEM campaigns through better ad copy. I’d encourage any SEM marketer to give them a look. This entry was posted in Uncategorized and tagged boostctr, online marketing, sem. Bookmark the permalink. Chris, I sort of see this business model plateau over time. As more ad copies benefit from optimization, there are two ways the stagnation can set in: 1) the relative improvement of each ad becomes less significant, therefore BoostCTR receives less revenue, and 2) it loses copywriters (no payout) because of fewer winning ads. Ray – in theory you’re correct, but a company like BoostCTR could grow 10-100X itself before that plateau effect played itself out across a wide enough swath of the SEM space to affect their growth rate, don’t you think? Kelly – great review, thanks for posting!